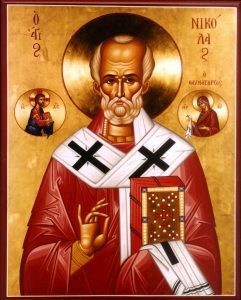 Today December 6 is the feast day of St. Nicholas the Wonderworker. Today celebrate all who are named Nicholas, Nicholas, Nikolina, Nikoleta, Nenka, Nina, Kolyo, Nico. St. Nicholas is the patron of sailors and fishermen, and this day is a holiday also the bankers. St. Nicholas is one of the most revered saints in Bulgaria and throughout the Christian world. He is considered: defender of the faith and the faithful, guardian of the hungry ,hilarity of weeping, patron on floating at sea ,peacemaker of feuding, liberator of innocent convicted, head of monks and guardian of chastity. St. Nicholas occupies an important place in the Bulgarian holiday tradition. According to folk beliefs, when his six brothers saints divided world, Nick taken all waters. He has patronage over sea storms and hurricanes. So on this day boats and ships do not sail the high seas. Fishermen, sailors and their families participate in the solemn liturgy, then organize wild celebrations. 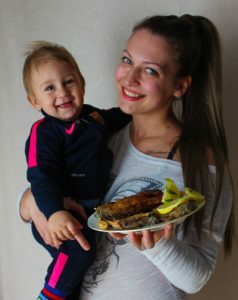 Today on the table in every Christian home there should be fish and fish dishes. The most popular fish, of course, is carp. It is believed that carp is a servant of the saint. The name of the saint is associated with many miracles and especially with the lives of sailors and fishermen. It is believed that on December 6 ends the autumn-winter fishing season. Caught fish from the day is given like a gift of the saint. I wish a merry meeting the feast of all who celebrate today! Happy holiday!